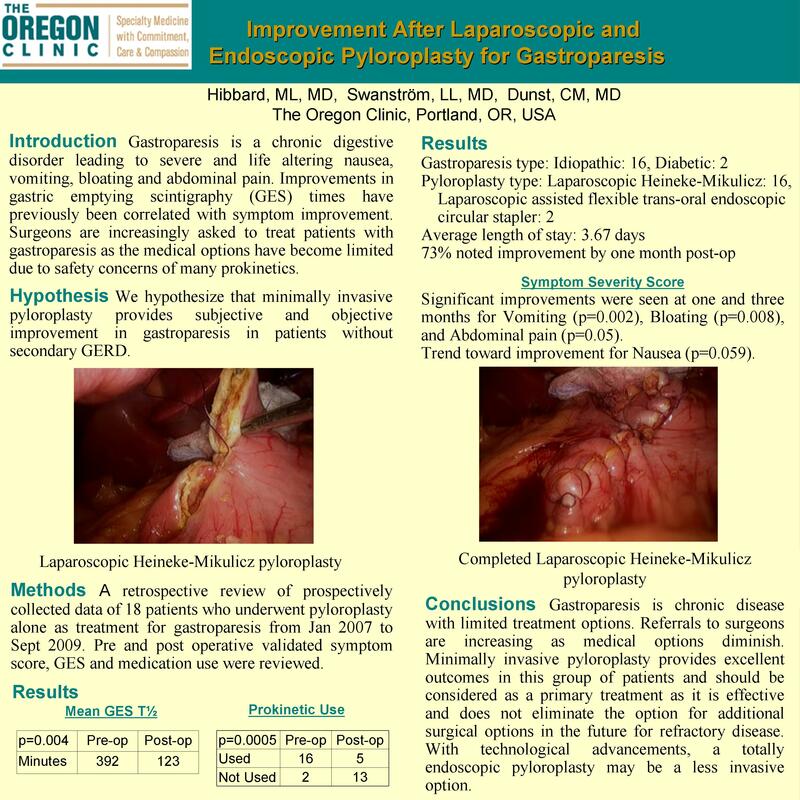 Objective: We hypothesize that minimally invasive pyloroplasty provides subjective and objective improvement in gastroparesis in patients without secondary GERD. Gastroparesis is a chronic digestive disorder leading to severe and life altering nausea, vomiting, bloating and abdominal pain. Improvements in gastric emptying scintigraphy (GES) times have previously been correlated with symptom improvement. Surgeons are increasingly asked to treat patients with gastroparesis as the medical options have become limited due to safety concerns of many prokinetics. Surgical options include gastric stimulator implantation, pyloroplasty and gastrectomy. Because most series examining pyloroplasty include anti-reflux procedures due to the high rates of concurrent overflow gastroesophageal reflux disease, limited data exists regarding the use of a minimally invasive pyloroplasty alone. Methods: Retrospective review from a prospective database identified 97 patients who had minimally invasive pyloroplasty from January 2007 to September 2009. Patients with prior gastric surgery or concurrent fundoplications for GERD were excluded. Eighteen patients treated with pyloroplasty alone constituted the study cohort. Pre and post-operative data from a previously validated five point symptom scoring system, GES, and prokinetic usage was collected. Statistical significance was assigned using Fischer’s exact test and t-test for independent samples. Efficacy outcomes such as length of stay, leak rate, obstruction rate, and need for re-operation were also recorded. Results: Sixteen patients had idiopathic and 2 had diabetic gastroparesis. A laparoscopic Heineke-Mikulicz pyloroplasty using running absorbable suture was performed in 16 patients. A laparoscopic assisted flexible trans-oral endoscopic circular stapler was used in 2 patients. Prokinetic use was significantly reduced from 89% to 28% (p=0.0005). The mean GES time to empty half of a radio-labeled meal (T1/2) decreased from 392 minutes to 108 minutes (p=0.004). Significant improvements in the symptom severity score were seen at one and three months for vomiting (p=0.002), bloating (p=0.008), and abdominal pain (p=0.05). Trend toward improvement were noted for symptom severity score of nausea (p=0.059). No leaks were identified. One patient underwent a negative laparoscopic re-exploration due to biochemical suspicion of a leak. One patient developed transient obstruction requiring gastric decompression. This resolved by 3 months with resolution of all symptoms. The average length of stay was 3.67 days. Overall, 73% of patients’ indicated that they saw improvement by the time of one month follow-up. Conclusion: Gastroparesis is chronic disease with limited treatment options. Referrals to surgeons are increasing as medical options diminish. Minimally invasive pyloroplasty provides excellent outcomes in this group of patients and should be considered as a primary treatment as it is effective and does not eliminate the option for additional surgical options in the future for refractory disease. With technological advancements, a totally endoscopic pyloroplasty may be a less invasive option.